Donna Sachet started her adventure in San Francisco over 20 years ago and the City has applauded her fun-loving spirit, quick wit, and musical talent ever since. 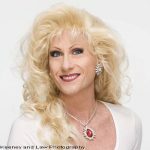 She served as Miss Gay San Francisco in 1992 and was elected the 30th Empress of the City in 1995. She co-chaired the San Francisco GLAAD Media Awards for 4 years, co-hosted a cable talk show for 6 years, has served on the Boards of Directors of Positive Resource Center, LGBT Community Center, EqualityCalifornia, and is currently on the International Court Council. Donna was chosen as Community Grand Marshal of the SF Pride Parade in 2005 and made history as the first drag personality to sing the National Anthem for a major league game when she sang for the SF Giants at AT&T Park in 2009. She currently writes a bi-weekly column for the Bay Area Reporter and stars weekly in Sunday’s a Drag at The Starlight Room in Union Square.